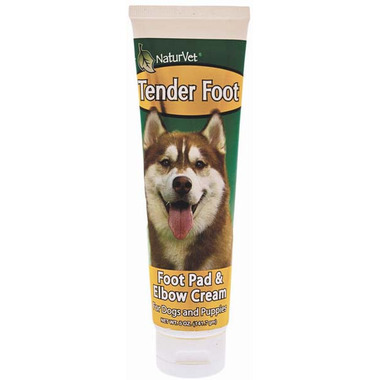 Naturvet Tender Foot Dog Foot Pad & Elbow Cream is a specially compounded multi-vitamin cream. This cream is used to protect, repair and restore lost resiliency to foot pads. You can also use to soften and moisturize elbows calloused by lying on cement and other rough surfaces! Ingredients: Vitamin A, Vitamin D, Vitamin E, Riboflavin (Vit. B2), Panthenol (Vit. B5), Pyridoxine Hydrochloride (Vit. B6), d-Biotin (Vit. H), and Niacinamide (Vit. B3). Always follow the instructions attached to the label of this product.